May | 2015 | Eltham District Historical Society Inc. 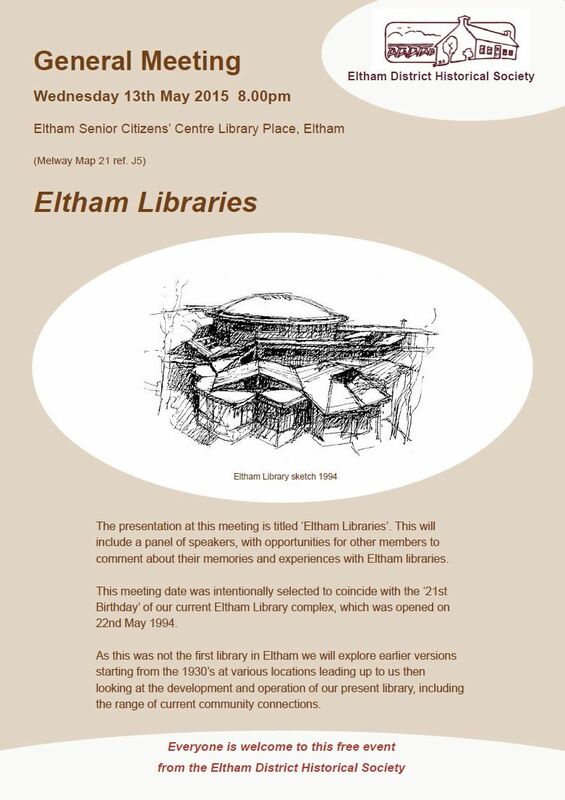 The presentation at our May meeting will include a panel of speakers, with opportunities for other members to comment about their memories and experiences with Eltham libraries. This meeting date was intentionally selected to coincide with the ‘21st Birthday’ of our current Eltham Library complex, which was opened on 22nd May 1994. As this was not the first library in Eltham, we will explore earlier versions starting from the 1930’s at various locations leading up to us then looking at the development and operation of our present library, including the range of current community connections. As at all of our meetings, new members and visitors are most welcome.